How Much Support Does Your Employee Training System Need? The way I see it, the work of the construction professional is beset on all sides by the inequities of the Client and the tyranny of governing legislation. The truth is Clients can be ruthless. Liquidated damages, open-ended contracts, intentional loopholes—all potential inequities that make the construction business harsh and unforgiving. Misinterpret a contract, and you lose. Complying with governing legislation can also seem like a burden. But, if you think employee training is expensive, consider project losses and the fines levied when an employee messes up. In Alberta last year, OHS fines amounted to $2,243,075.00. When a worker gets hurt, and you can’t prove “reasonably practicable”, you’re paying both a fine and increased insurance premiums. Everyday, your bottom line is at risk! A technology-based solution like Online Training can streamline your overhead costs, ensuring employees are efficiently prepared for the jobsite. How do you feel about shaving an extra $100k off your fixed costs? Companies with workforces of 2000 or less have observed savings in excess of $98,000 – coming directly out of overhead. Have you considered the costs of a new-hire orientation? Have you multiplied that for the number of new-hires you train over a year? Let’s do a quick breakdown of the costs for face-to-face in-house training. Scenario A: New-hire spends one hour completing paperwork, then attends a three hour orientation session. Is the total cost four hours of the employee’s time? No. There are several other associated costs, the Trainer’s time, which could be three hours of orientation time with the employee, plus an hour of prep time before the session, and an hour of debriefing after the session. Also factor in one hour of administration time in updating employee training records, and associated reporting that may be required by the Client. A new-hire orientation can incur 10 hours of pay for zero productivity—three hours where the employee takes in important information, and seven hours delivering and documenting the information the employee received. Imagine a streamlined process where the employee receives three hours of information, and a fixed cost technology-driven solution delivers and documents the training? Scenario B: Consider the associated costs in training a fully resourced Trades person. They could reach 100+ hours of non-productive employee time, when you factor in: trainer, supervisor, administrator and human resources. Based on a $40.00 an hour wage – that’s $4,000 before he swings a hammer, or turns a screwdriver. Multiply that by your total workforce…it’s significant. An Online Training System is the solution to streamlining the training process and reducing the business costs associated with developing your most important assets. When referencing overhead costs associated to training mentioned earlier, an organization can achieve savings of up to $1920.00 (that’s 52%) per head trained…check out the table below to see how the savings apply to organizations of different sizes. For programs that are more practical in nature, such as equipment operation, or confined space, there are many options available to “blend” the online training component with an in-person evaluation component. Training companies exist with people on staff to meet your evaluation needs. Simply arrange for employees to take the online program, and book a date to have the trainer come out and do a practical evaluation. Alternatively, you can build your own evaluation program, deploying your personnel in the key role of evaluating competence, rather than presenting material. Leaning out your onboarding process can be done with much of it happening prior to the employees first day on the jobsite. Depending on your process you develop, you may find the only thing left to do is an onsite walk through / orientation to familiarize your new personnel before getting them on the tools. 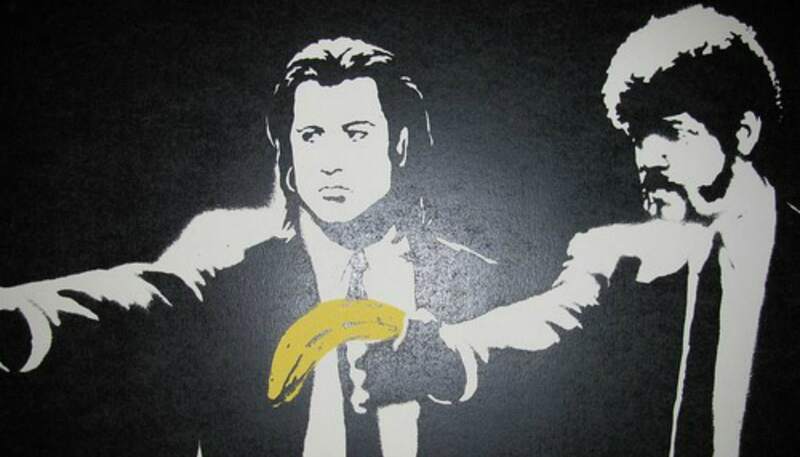 Banksy: Pulp Fiction. Author: eddiedangerous. https://c2.staticflickr.com/4/3230/3130451045_7bf13f04b5.jpg This file is licensed under the Creative Commons Attribution 2.0 Generic license. U.S.Department of Education. (2010). Evaluation of Evidence-Based Practices in Online Learning: A Meta-Analysis and Review of Online Learning Studies. Washington, D.C.: Office of Planning, Evaluation, and Policy Development.